Gewächse der Seele: Floral Fantasies between Symbolism and Outsider Art is the title of an interdisciplinary and inclusive collaborative project that will run from 31 March to 4 August 2019. The Wilhelm Hack Museum in Ludwigshafen, the Prinzhorn Collection in Heidelberg, zeitraumexit in Mannheim, together with Galerie Alte Turnhalle in Bad Dürkheim and Museum Haus Cajeth in Heidelberg, will be illustrating the significance of plants as projections of mental states in a variety of contexts. 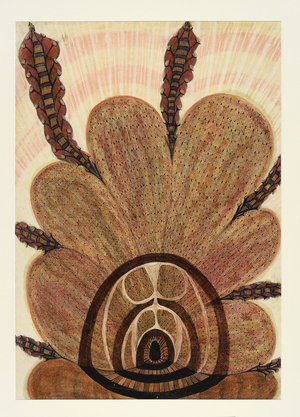 The fascination encountered in outsider art with plants, plant-like beings, plant personalities and plant-animal hybrids continues to occupy a broad spectrum even today. These artistic manifestations of vegetal life can be enjoyed in the form of exhibitions, installations, performance, dance and theatre. The Prinzhorn Collection is exhibiting a multifarious assortment of plant motifs from its own holdings. These works were created in psychiatric institutions between 1900 and 1940 by, among others, Else Blankenhorn, Heinrich Hack, Hanna Hellmann, Wilhelm Maasch and Frau von Zinowiew. Alongside naturalistic depictions there are also works of abstraction, floral lettering and entwinings of vegetable, human and mineral elements. 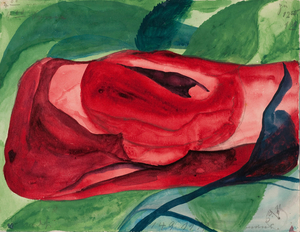 The astonishing early output of the Czech artist Anna Zemánková from the early 1960s is in a category all of its own.